Lord Grantham is superior to all other men, and has the listing in Debrett’s Peerage to prove it. Look at how debonair and handsome he looks in his evening wear, leaning against that Rolls with the right degree of “I’m king of this realm” but not too much arrogance. We can ding Robert for marrying Cora Levinson for her money, but unlike most fortune-hunting aristocrats, he fell in love with his American heiress bride and treats her as an equal! Perhaps Robert may seem boring and settled, but why shouldn’t he? After all, he has a sharp-tongued mother to deal with, three unruly daughters, a valet who disrupts the entire household with his troubled past, a new heir who did nothing to mask his disdain for his position, and now the war has thrown everything he holds dear at sixes and sevens! It’s a wonder he didn’t chuck it all and go to France whether the Army wanted him or not. There’s much to commend a man who upholds responsibility and duty as necessary to the social order. Compared to the other men of Downton, Robert is someone I’d trust with my life. I mean really–Branson, a controlling anarchist who, instead of arguing his political position, plots to dump muck on an English general’s head? Bates, who continuously lets down Robert and Anna, as well as the household? And lastly, Matthew, who cannot make up his own mind about anything, whether it be treating his own valet with respect to deciding whether he wants to be with Mary or with Lavinia? There are no comparisons! 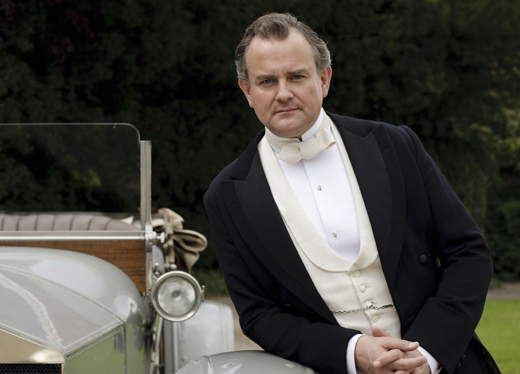 Leave a comment in support of the upstanding, honorable Earl of Grantham. Ah Lord G is a prince of a man. But he’s no Bates. Oh dear, it seems to me that you are wearing rose colored glasses or have dropped some opium in your nosegay. Lord Grantham is the most clueless man on the show. He has zero clues to anything that is going on in his own home. Lord Grantham doesn’t need clues to deduce the whys or hows of the world. Whilst Lord Robert is off snogging the housemaids, it seems to me you have left out the most consistent and steadfast member of the household, Carson. I lost all respect for Lord G after last night’s episode. Smooching with the maid while Cora lies sick and possibly dying in their bed? Sooo disappointed to see Lord Grantham kissing Jane, the housemaid. I had thought that he was above that .. it was a card Julian Fellowes should have left unplayed. I have lost respect for him, as well – it was the first cheap shot plot line I’ve seen in Downton. I thought the “amnesia victim who MIGHT be the heir” was a pretty run-of-the-mill soap opera plot element. And O’Brien salving her own conscience by sobbing out a sort of confession to a woman was either on her deathbed or in the grip of a delirium that would keep her (Cora) from remembering what she’d heard after her recovery – for all the trouble O’Brien’s managed to stir up, if that was supposed to bring her back to the devoted, loving, house-servant fold with no further repercussions, I’d cry foul. She’s Irish – she ought to have to go to Dublin to take care of Sybil & Tom and their baby. Would you still count on him for your life now? His arrogance has put the whole estate in financial peril and he fights reform at every turn. He killed his own daughter out of ego of having to be right about doctoring. Horrifying, last night, to have Lord Grantham appear at Mrs. Crawley’s luncheon and show his arse .. I was stunned. Lady Cora handled it beautifully, Isobel stood up to him with glittering eyes and a cold smile, the Dowager Countess took the high road and sat quietly watching it all go down, and Carson caused quite a brouhaha so I hope that Lady Cora finishes the charlotte dessert and heads back to Downton to bring Carson up SHORT on his poor decision. The more I see of Lord Grantham this series 3, the less I like him. On the other hand, lovely to see that the ladies know how to behave, and how to handle a social cretin like Robert. I felt very badly for Ethel, and applaud Mrs. Patmore for her guidance and support to help Ethel succeed in her new position. Matthew’s not the most subtle or politically astute character, but at least he inserts some sense into the equation – Robert seems to only admire and tolerate those who accommodate his intentions and support his actions.